To confirm our present delivery time please contact our factory on 01723 321 000. 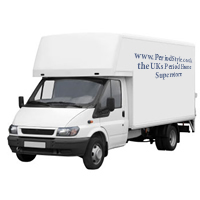 The pallet of your cast iron radiators is delivered to you as the delivery driver is prohibited from manually handling heavy items and will only deliver to the kerb-side adjacent to your delivery address. Cast Iron Radiators Ltd will select the most appropriate carrier for your goods. This means your delivery may arrive in more than one batch to ensure your order is transported in the best possible way. Whilst every reasonable effort shall be made to keep to any delivery date, time of delivery shall not be of the essence and Cast Iron Radiators Ltd shall not be liable for any losses, costs, damages or expenses incurred by the customer or any other person or company arising directly or indirectly out of any failure to meet any estimated delivery date. The risk in the goods shall pass from the company to the customer upon delivery of such goods to the customer. Cast Iron Radiators Ltd shall have no liability to you for any failure to deliver goods you have ordered or any delay in doing so or for any damage or defect to goods delivered that is caused by any event or circumstance beyond its reasonable control. In the unlikely event that you need to return a product purchased from Cast Iron Radiators Ltd then you have 30 days from the day you receive your item to do so.